The idea of a fighting game in which you don't actually do any fighting might sound like an odd one, but that's precisely what you'll find in Punch Club. 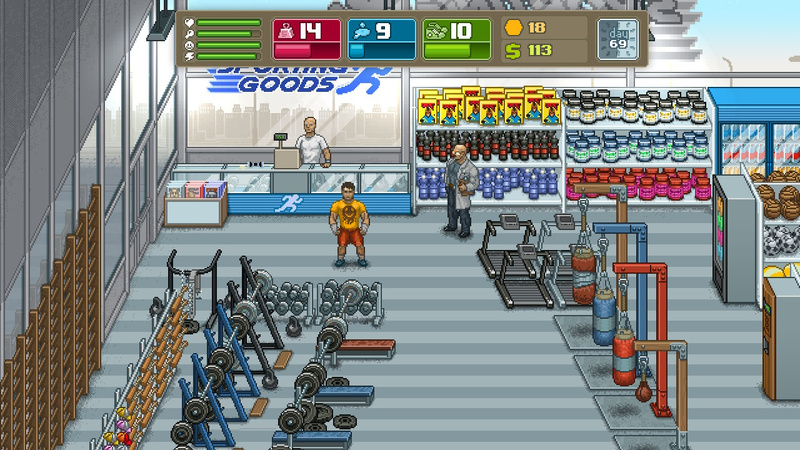 This is a conversion of a casual management simulator that started out life on PC and mobile before making its way to 3DS and other consoles last year. There have been no radical changes in the intervening months and years. After a brief intro outlining your character's Daredevil-like origin story (minus the blindness and the superpowers), it's on to training your young buck up to be an MMA champion. In practice, this means taking control of his entire life - working jobs, buying food, forming relationships - as well as training up your fledgling combat skills. Whatever mundane task you're undertaking, however, it only ever lasts a few seconds, and involves virtually no direct input. Working a manual labour job involves pressing 'A' to start, then again to finish. So too does sleeping at home and training at your local gym. Eating, meanwhile, requires a simple trip to the fridge, provided you bought the necessary fresh food at the supermarket. 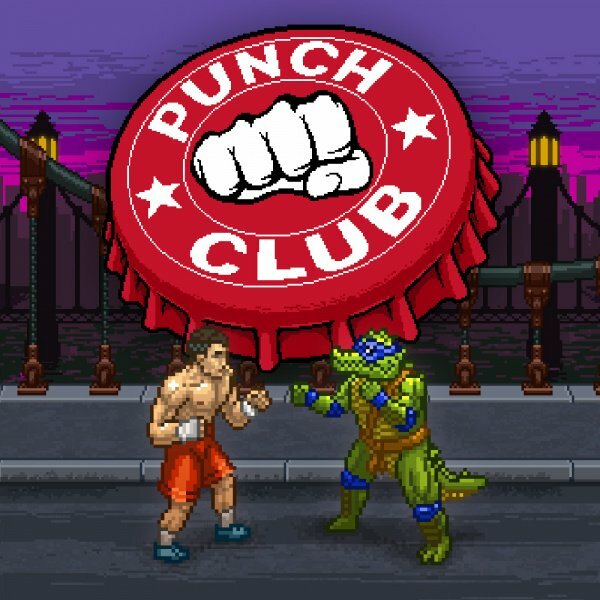 Punch Club spices up these mundane tasks with a dash of self-aware humour and an unashamed willingness to bathe in '80s and '90s pop culture. Whether you're engaging in an impromptu scrap with a succession of sewer-dwelling mutant lizards or wooing a woman named Adrian, there are nods aplenty for the eagle-eyed (and just plain old). Sure, it's a cheap and hackneyed way to buy your affection, but it's effective. Whatever task you're completing, though, your job boils down to watching a series of fluctuating stat bars representing your various levels, and then judging when enough is enough. Every activity essentially fills up some and empties others, with time given a crucial stat bar of its own. 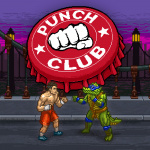 It's an approach that carries through to the most important portion of Punch Club: training up your fighter. 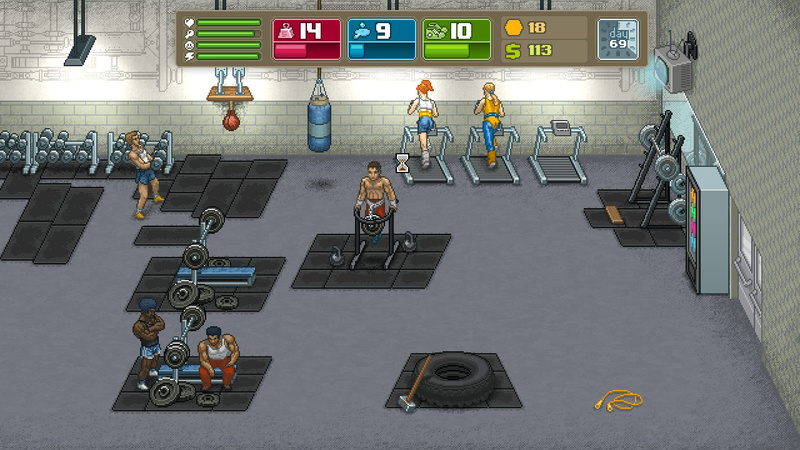 You can improve your brawler's three core attributes - strength, agility and stamina - by using certain pieces of gym equipment. However, your abilities will degrade over time when you're not exercising, so it's best to reserve the really hard graft for the period just before your next fight. Given that time is a finite resource here, it's a good idea to focus most of your efforts on one particular attribute. Specialisation is the key, and that's driven home by the sprawling ability tree that gradually opens up to you. It's only by really concentrating on one of three styles of fighting (each loosely mapping to one of those attributes) that you'll be able to unlock the game's more advanced combat techniques. 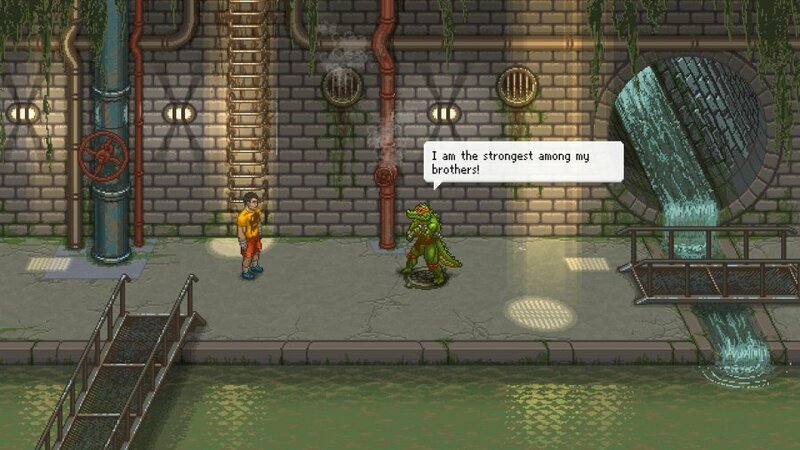 All of which plays out in Punch Club's fights, which offer the most intense and extended sections of the game. Don't get me wrong, it's still a case of pressing 'A' and watching various bars move, but this time there's the added bonus of watching two pixel-art jocks taking chunks out of each other. That's not to say that there isn't a certain amount of strategy to these fights, however, particularly as your ability-set expands. In between rounds you get to switch out your fighter's active moves, so if they're taking a beating from a heavy hitter you might want to add a block or dodge. If they're running low on stamina relative to your opponent, you might consider swapping out that energy-sapping uppercut for a jab, or maybe adding a punishing leg kick that will bring your opponent down to your level. It's amazing how compelling watching the game's crude scraps can become. Part of this is down to the fine 16-bit artwork and brilliant chiptune soundtrack, which combine to evoke the SNES era way better than most so-called retro efforts we see today. But it's also down to the investment you've put into developing this character, and the unique imprint you end up putting on them. It's a genuine role-playing experience. Ultimately, though, the sheer simplistic grind of the game's core gameplay loop wears you down. There are only so many times you can perform the same hands-off tasks to bolster the same arbitrary numbers before you start to feel like a ninja-mask-wearing hamster in a wheel. Especially here on Switch, you can't help but feel that it would benefit from more varied and tactile gameplay mechanics rather than simply asking you to sit back and watch the action unfold. 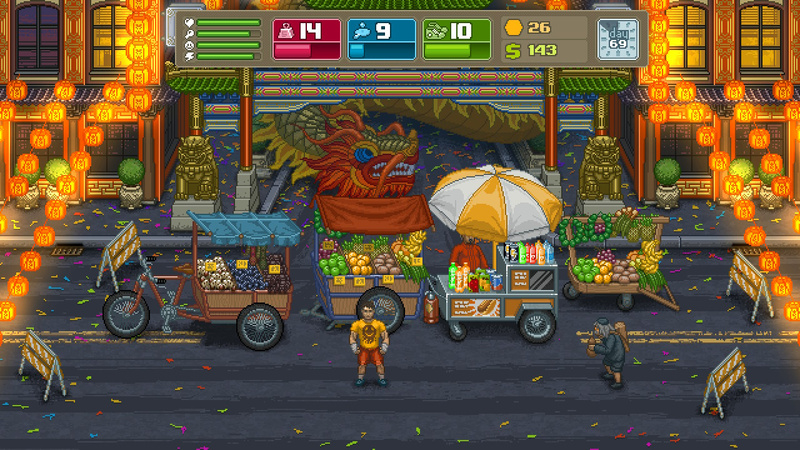 Punch Club is an effective casual management sim with a well-observed 16-bit aesthetic, but its grindy hands-off mechanics soon start to grate. Here on Nintendo's flagship console, it just feels a little too remote and repetitive to be in with a genuine title shout. Nintendo, please release a new Punch-Out! Its a great game, but I'm not buying it again. Ready for a sequel. Glad to see some positive reviews in the comments... maybe I’ll check it out. Been playing it a lot today. Its pretty addictive and fun to see your guy get stronger. Though it does feel like there isn't a whole lot of variety in what to do. Your ingame days easily become the same routine over and over. Personally been preferring the pixel stylings of Death Road to Canada. I thought the game was pretty fun but the main thing keeping me from double dipping is how buggy and broken the 3DS version was. Worried about running into some of the same issues. Got it on mobile phone, I suspect the phone version is as good as the PC. Mobile phone game gets a score that fits it. Really hope this mobile to Switch trend ends. Seeing Ubisoft bring Hungry Shark World to Switch made me throw up a bit in my mouth. I was watching someone play this and it is pretty disappointing, the gameplay seems very simple. You don't even control your character directly when you fight, the whole thing seems to revolve around stats grinding. The devs actually made zero profit on PC, 97% of players were piratebay skanks according to dev.